This year we are working with a senior housing development in Bozeman, Legion Villa Apartments. This complex offer affordable housing for seniors over the age of 62 under the Department of Housing and Urban Development, Section 202. This multi-unit complex offer independent living for seniors close to downtown Bozeman. Despite available space these apartment do not offer gardens for their residents. Sage Gardeners believes that we can help improve the quality of life for many of the senior residents by providing multiple raised accessible vegetable gardens for their residents. We can help reduce isolation, improve food security and nourishment, reduce spending, and increase their mental and physical activities through the efforts of gardening and horticultural therapy. As additional funding is received through the season, we will likely implement additional senior retirement home communities, as there is a waiting list in Gallatin County for Sage Gardeners' assistance. Building the raised redwood beds! 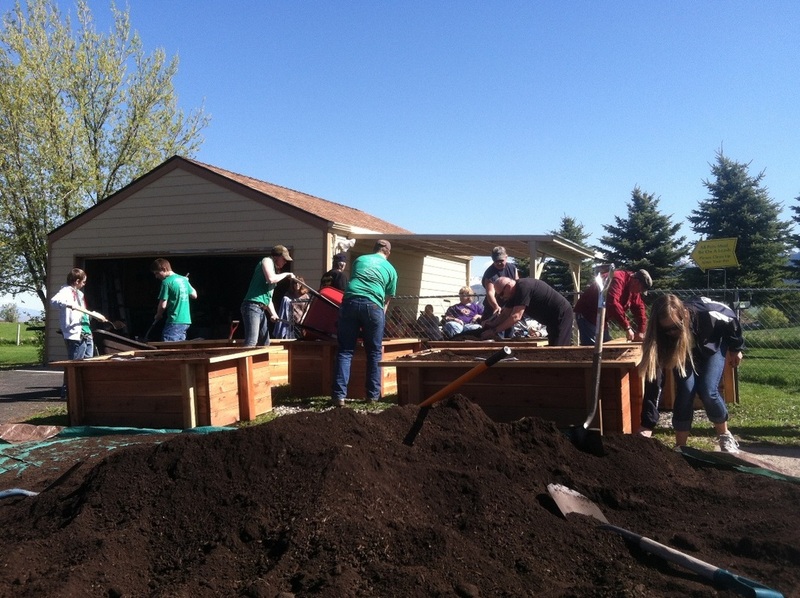 Volunteers and Seniors help fill the beds! Mid-summer growth... many have uniquely personalized their beds. We are still going strong even into October! As most of our gardens are currently getting ‘put to bed’, we have one last project underway at the Cancer Support Community. 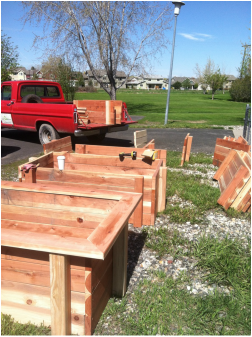 This specific project for Sage Gardeners, Cancer Support Community Project, involves building several large raised redwood vegetable garden beds at the Cancer Support Community’s new therapy garden, Garden of Hope, located at their facility in Bozeman, Montana. In an effort of collaboration on the Garden of Hope, our goal is to complete our portion of the gardens by the end of October 2014. The design portion of the gardens is now complete (estimated size and dimensions to include six large raised beds), and in October we will build, deliver, install, and fill (but plant spring 2015) with the assistance of many community volunteers: and hopefully with your help! The Cancer Support Community served roughly 640 individuals from across Montana last year. Statistically, 60% of all cancers in the United States occur in people age 65 and older. We could only be so grateful knowing that we helped one family or even one individual improve their quality of life because they were able to get their hands dirty and garden; or maybe they learned healthier eating habits from taking a cooking class that encourages adopting an organic-friendly lifestyle (one of the many classes offered at the Cancer Support Community that will utilize our gardens). The Private Residence Projects started off with meetings, flyers, and presentations to solicit recipients for the project; it has grown to become such a bigger project thanks to word of mouth from our community members and the seniors themselves. Every year by March 1st we seem to have a waiting list from all across Gallatin County and some even further. We provide raised redwood vegetable garden beds to seniors that live independently but can't quite garden with as much ease as they used to in the ground. This year we have requests from senior residents in Three Forks, Belgrade, Pony, and Bozeman. While our biggest request and one that is heard repeatedly is that everyone wants another garden... we wish we were able to provide abundant gardens for all those that ask, but we need to fulfill all those requests who haven't received even one! Who knows, maybe someday a special angel grant will come through and we can shower our yards and porches with gardens galore!!! Stay tuned! Our Maintenance Project is such a fun and rewarding experience for everyone involved. Every year our list grows and we are able to stay in touch and help with gardens from past year's recipients. We assist in everything from donating seeds in early spring in an effort to get seniors indoor gardening as early in the season as possible, to topping off soil and compost each year, providing vegetable starts in early summer, to helping with pest control and general gardening questions. We also provide seed and planting days with our retirement communities and have volunteers check-in weekly to assist in weeding, watering, harvesting, and discussions. Sage Gardeners stay in touch with all of our past recipients as needed and as to the need or desire of the resident and/ or community.